Discussion in 'News' started by Meredith Hein, Jan 3, 2016. After a win over Minnesota to open conference play, Ohio State is turning its attention to Illinois. Conference play has officially begun for the Ohio State Buckeyes, who are riding a five-game winning streak into Sunday’s matchup against the Illinois Fighting Illini. The Buckeyes opened Big Ten play with a 15-point win over Minnesota behind a 20-point performance by junior forward Marc Loving, and hope to make it six-straight after falling below .500 just a few weeks ago. After embarrassing losses to UT-Arlington and Louisiana Tech, Ohio State rebounded with an improbable win over No. 4 Kentucky on its way to a 9-5 record. Now, the Buckeyes are turning their attention to 8-6 Illinois, who had been riding a five-game win streak of their own before falling in their first conference game to Michigan last week. Junior guard Kendrick Nunn led the Illini in scoring with 23 points in the team’s 10-point loss. Nunn, who leads the Illini in scoring on the season, also had six rebounds on the night. Moreover, the three leading scorers for the Illini are upperclassmen, compared to the relative youth of the Buckeyes. Ohio State has managed to come together over the last few weeks after a rough start to the season, and has learned to overcome deficits that would have proven fatal just a few games ago. Against Minnesota, for example, the Buckeyes came back after blowing a 15-point lead and falling behind by two points in the second half to ultimately win by double-digits. Freshman guard Jaquan Lyle led the Buckeyes with 13 assists against the Gophers--more than half the team’s total of 24. Lyle leads Ohio State in assists on the season as well, averaging 4.9 per game. These assists proved critical against Minnesota, as Ohio State’s offense was able to settle into a rhythm instead of relying on fast-break points. When the Gophers began to close the gap and ultimately pull ahead in the second half, the Buckeyes recovered by slowing the game down and not succumbing to Minnesota’s pressure. Ohio State missed seven of 22 free throw attempts against Minnesota, which, statistically, is in line with their 65.7 percent average on the year. Freshman center Daniel Giddens, who backs up Trevor Thompson, has the worst free throw average on the team at just over 39 percent. In Big Ten games that are bound to be more down-to-the-wire than non-conference matchups, Ohio State will need to ensure that it does not leave points on the court in the form of missed free throws. Loving’s 20 points against Minnesota was his second-highest scoring game of the season, and a welcome change after Loving scored just six points against South Carolina State and four against Mercer. He also managed to go 3-for-5 on three-point attempts against the Gophers, and shot 54.5 percent from the field. Loving will need to continue to producing on offense at this level as the Buckeyes continue on in the tougher competition of conference play. More importantly, as we have seen throughout the season, Loving will need to continue to be leader for this young team as they continue to find their rhythm on offense, and will need to consistently score at a higher level in order to take pressure off his teammates. Despite his 13 assists, Lyle had a grand total of four points against Minnesota, going just 1-for-5 on field goals and missing all three of his three-point attempts in 24 minutes played (at least he was 100 percent from the free throw line, making both of his attempts from that mark). Previously, Lyle had dropped just two points against South Carolina State, making only one field goal in 24 minutes played. These performances are head scratchers after an 18-point breakout game against Mercer. Like Loving, Lyle will need to improve his scoring to ease pressure on the rest of the Buckeyes’ lineup. Nunn leads Illinois in scoring, averaging 19 points per game in 34.4 minutes played, the second-highest minute total on the team. He also shoots nearly 44 percent on three-point attempts and, rounding out his game, averages 5.3 rebounds per game. The 6-foot-3 junior guard from Chicago has had significant playing time over the last two seasons, but missed the first five games (including three non-conference losses) of the 2015-16 campaign following surgery on his thumb. The Buckeyes will need to hold Nunn’s scoring in check, especially from the three-point line. Coleman-Lands, a 6-foot-3 freshman guard from Indianapolis, dropped 13 points in 29 minutes played against Michigan in the Illini loss. However, 11 of these points came in the first half, and show the true struggle Illinois has faced this season in playing a complete game through the second half. 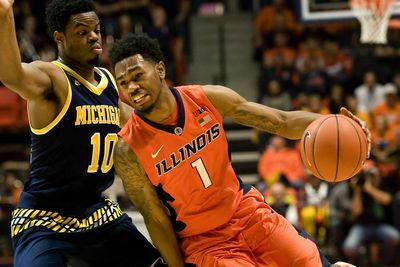 Coleman-Lands, who suffered a stress fracture in his foot over the summer, is one of two freshman who has been starting for the Illini as of late (forward Michael Fink the other), and has the potential to play the complete game that the Illini have been missing this season by continuing to score big numbers in the second half.